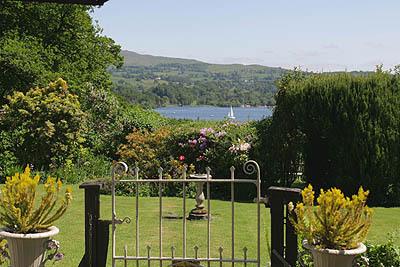 Slack Cottage is set in 10 acres of ground bordering the quiet western shore of Lake Windermere. It is peaceful and secluded, the perfect choice for a relaxing break away from it all. Four miles from Ambleside and one and a half miles from Hawkshead, the cottage is a 300 year old listed building, once owned by Beatrix Potter. 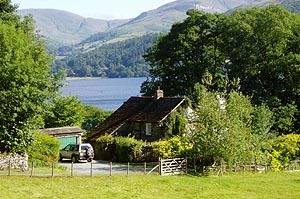 It has been carefully furnished in the classic Lakeland cottage style and has full central heating. Two twin/super king en-suite rooms are available – both with stunning lake views. They are individually furnished to provide stylish and homely accommodation. Your hostess is Mrs Liz Lane who is pleased to be able to share this special place and highly commended accommodation with guests. Full English or continental breakfast is served in the dining room with views of the lake and fells beyond Ambleside. Any diets can be catered for – please let us know in advance of any special requirements. There is colour television and hot/cold drink trays are provided. The warm sheltered garden is yours to enjoy, daffodils and bluebells in spring, glorious colours in autumn, and a profusion of plants and wildlife, including red squirrels and deer. 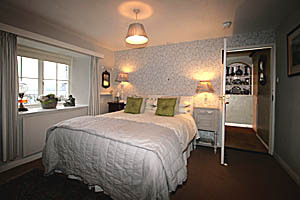 Tariff from £39 – £48 per person per night according to season and length of stay. We are normally open all year. There is plenty of parking. Mrs Liz Lane, Slack Cottage, High Wray, Ambleside, LA22 0JQ.